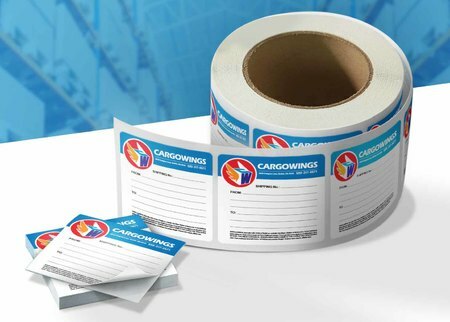 Custom shipping labels to send branded products and documents. Shipping labels help you spread your brand with every document and product you send out. Custom shipping labels come in assorted stocks and finishing options. To catch extra attention, print shipping labels with a custom shape like a rectangle with rounded corners, square, square with rounded corners, circle, or oval. Choose the paper stock that best fits your brand image and shipping needs. For example, you may choose durable white vinyl, a material meant to stand up to vigorous indoor and outdoor use for general purpose shipping labels. But if you want something that could better match a brand or specific look, we also offer label stock in matte and gloss finishes. We offer a broad range of sizes for shipping labels.The options make it possible to create eye-catching labels that match both your brand and the items you send out. Same Day Turnaround: Cut-to-size shipping labels can be printed the same day you order. Roll labels can be ready to ship or pick up in as soon as two business days. Our layout templates ensure that your shipping labels meet our printing guidelines with bleed lines and more. You can download the right layout template in an EPS, PDF, or JPG format. Shipping labels are an overlooked and underutilized avenue for promoting your brand. Where generic shipping labels will just get the job done, when you print a shipping label customize for your company, you add value to every package you ship. This means that every time your recipients receive a package, they immediately see your branding on the outside of the package, and associate your logo and branding with you. Customized labels on packages can help build excitement, anticipation, and ultimately a better experience with your brand, which can effectively turn into recurring sales and more revenue.